Another blistery weekend in Florida…. Well to you in the North, it may sound like summer…..
Wind was coming out of the Northeast at 10-15 and it was in the 50’s all day on Saturday. We first stopped at Faver-Dykes at Pellicer Creek. They had a fishing dock on the creek in the picnic area, so I decided to fish that stretch first. It was shallow, and the tide wasn’t moving much, but it was going to pick up according to my tide calendar. No bites, so I moved to the small boat launching area, and still no bites on the Berkley Gulp or the Yo-zuri. I went back to the dock and a gentleman was trying out a new rod he just purchased. On his second cast, he landed a nice flounder! That’s fishing! Next, we went to the Anastasia State Park. 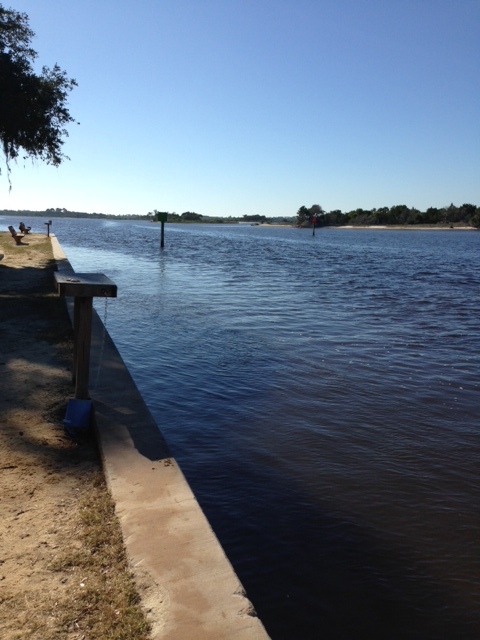 This park is along the beach in St. Augustine, and also has an inlet area to fish. The beach had massive waves, and was not what I was looking for, so I tried the inlet. It was shallow, and I tried wading a bit but no luck. 0-2 for the day, not a good start in St. Augustine…..
Sunday we started out at a very interesting park called Washington Oaks. I highly recommend this park for the gardens, and the massive oaks, and dolphin watching. They have a nice seawall along the inter-coastal, and the channel comes very close to shore. It looked like a decent area to fish, so I started with the Yo-zuri. I lost my favorite lure in a tree, so things were not shaping up to well. 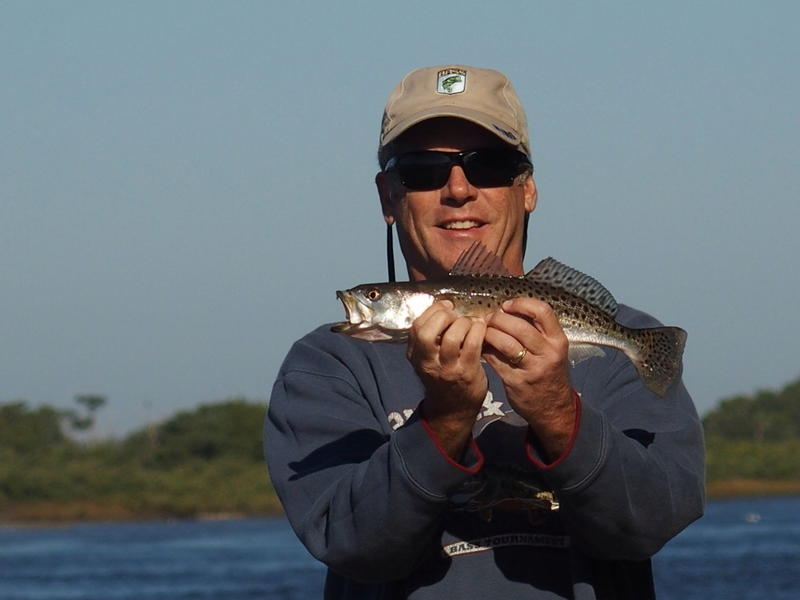 I had a few bites, on the Gulp, but went back to a blue back Yo-zuri and caught this nice trout right on the corner of the seawall which made a great ambush point for the trout. 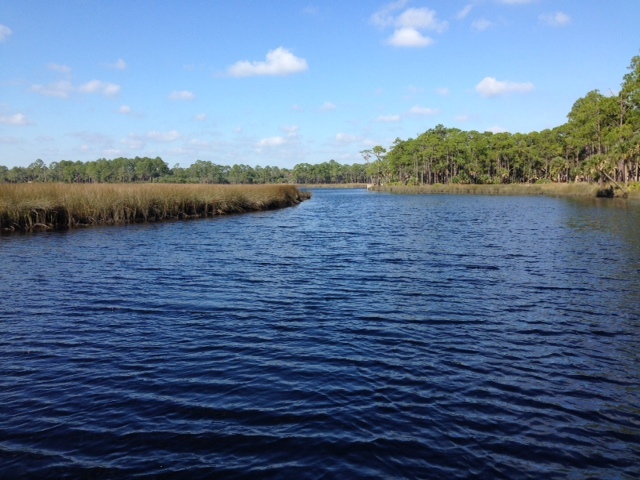 The last stop on our list was North Peninsula State Park that is just south of Palm Coast. It had a beach area, but it was super crowded. I decided to fish the inlet called Smith Creek where the drawbridge is located. Be prepared for the horn! The first time that went off, I almost jumped in the water! I had a few strikes on a Bass Pro Shops Shrimp lure on a jig head, but could not connect. A family of 4 fished close by, and we did get to watch the mother catch a nice black drum that almost destroyed her spinning outfit. Drum can really pull, and if you do not have the right equipment it can be a battle to get them in…. All in all I would recommend the Washington Oaks park if you are in the Palm coast/St Augustine area, and if you like the beach Anastasia. This entry was posted in Uncategorized on December 3, 2014 by shurstrike.